SOUTH HOLLAND, IL–South Suburban College’s Anna Helwig, Ph.D., Dean of Science, Technology, Engineering, and Mathematics (STEM) was presented with a Board Recognition Award from Bremen High School District 228 at their Students in Leadership Board Meeting this week. 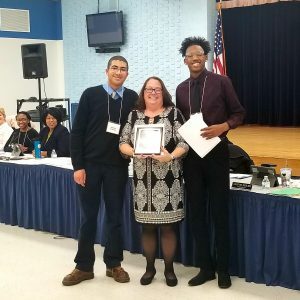 According to the District, the award is intended to acknowledge individuals who have provided above and beyond service or assistance to its students. Dr. Helwig said she has enjoyed working collaboratively with District 228 to engage high school students in all of the technology opportunities that SSC’s provides, including its Manufacturing Lab, Maker’s Lab, CNC Lab – all housed at its Oak Forest Center (OFC) near BHSD 228 schools. She also serves as the lead contact for the District’s Alternative Education Program and has assisted in creating new college classes for DELTA students, now housed at the OFC. Bremen High School District 228 students Alonzo Arostegui (left) Jamal Cole (right) presented SSC’s Dr. Anna Helwig, Dean of STEM, with a Board Recognition Award as part of the District’s Students in Leadership Board Meeting this week.